2013 Road Trip Notes, Day 4: Refuge in a Gated Community « Midlife Crisis Crossover! We hail from one of seventeen states that has never had a Chinatown to call its own. When we visited Manhattan in 2011, we spent hours walking through their Chinatown and immersing ourselves in surroundings resembling absolutely nothing back home. When we assembled our Boston to-do list, we considered their Chinatown was an obvious must-see. I wouldn’t call myself a travel authority by any means, but I imagine every great Chinatown needs a giant-sized gate like theirs. The area around the Chinatown Gate had many of the right elements: signage we couldn’t read (except a few Japanese businesses my son could interpret); pointless crosswalks; happy children playing; benches and tables for relaxing; other out-of-towners wandering aimlessly like us; and men gathered around a table, possibly gaming. We were surprised at the lack of exotic groceries and strange candies, but tried to make the most of the day anyway. Unfortunately, we began our search for the Gate on the west end of Beach Street, when in fact it’s on the east end. 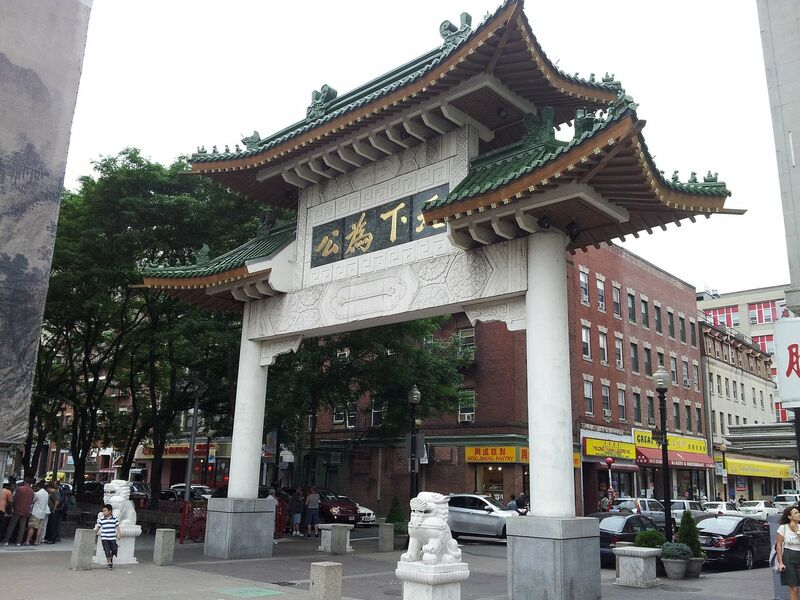 It was to our misdirected advantage, then, that Boston’s Chinatown is only a handful of blocks long and therefore didn’t wear us down too hard. (Cool temperatures were an unexpected plus.) Our long walk through the neighborhood took us past innumerable restaurants, a few gift shops, one DVD store, several sadly empty storefronts, and two construction zones that hopefully won’t destroy the ambiance with their completed projects. * Dinner at Gourmet Dumpling House. Thumbs-up to their pan-fried dumplings and polite tolerance of us Midwestern hicks. * Value-priced snacks from one of the bakeries next door (forgot to note which — the area seems to have many bakeries). * A decorative dragon statue for either my cubicle or my home creative space (haven’t decided which). * Maybe a few strange looks from the residents, especially when I tripped and nearly fell on someone’s car. That’s my usual style — not quite the master of blending in with a crowd. Reblogged this on Jstar's World.